This charming couple win the most patient award. They commissioned this painting and it turned out to be a very busy year so at last they got their masterpiece. I always get the best clients. 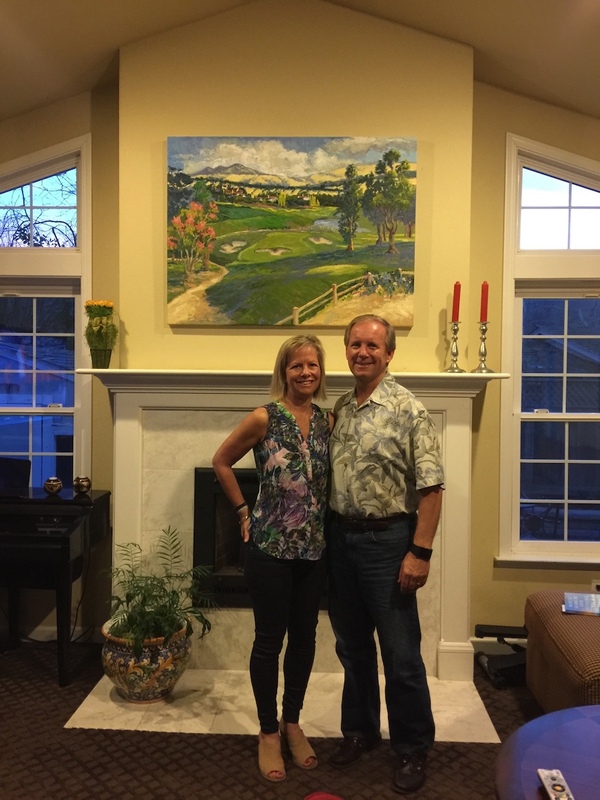 A wonderful couple in Michigan saw a painting of mine at a friends house in California and wanted one just like it but a different size and so on---- love it! So I took the opportunity to go back to that loacation to find the house had been taken down and a new house put in its charming place. I remembered the house because it was one of my favorite spots for a few years. So with an image I got to paint this wonderful place again. Thank you so much for the adventure! 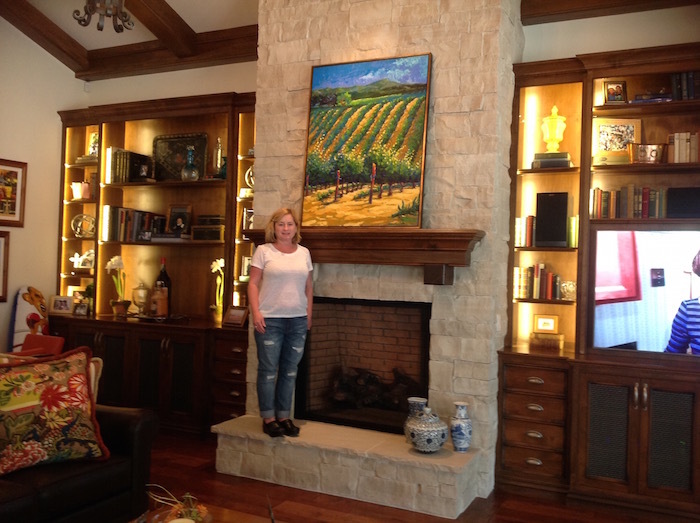 I am so happy to have one of my paintings in this beautiful house of Megan and Dave's. Got to meet the dogs, the daughter and of course Megan who is posing with the painting. I know they will enjoy this work for a very very long time. Cheers!!! 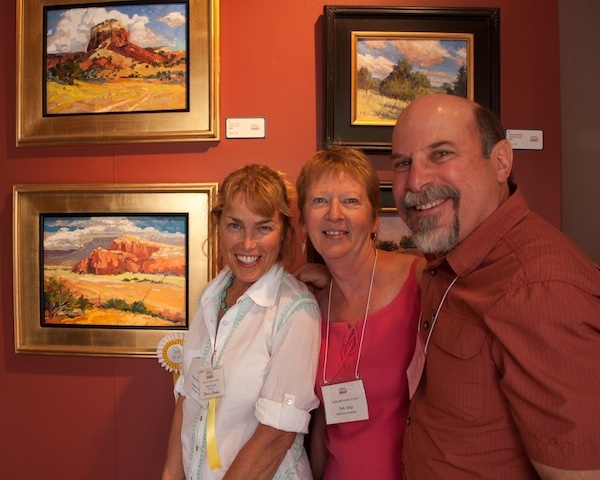 I met this lovely couple at Lafayette Art and Wine Festival a few years back. They have commissioned work and bought things that were just right. This one is one that was just right. To understand this fully you have to know that Moraga is full of daffodils in March. The garden club has planted hundreds. Seeing the daffodils lets us all know winter is just about over, no need for a ground hog here. I was lucky to be able to work with this lovely lady and her designer. 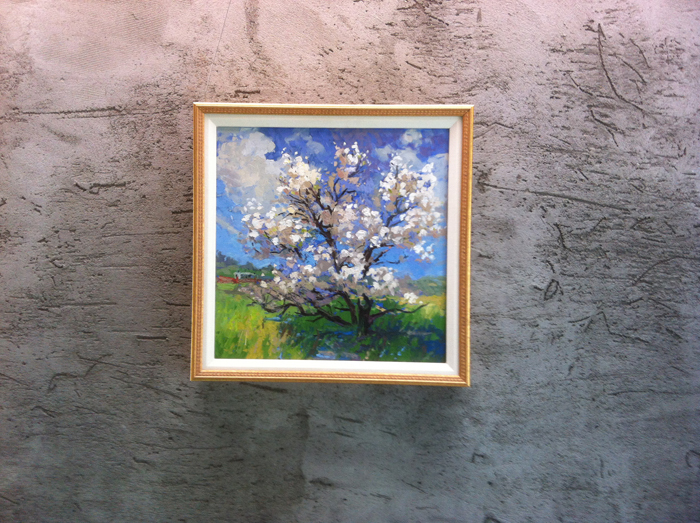 The right painting and the right frame all came together and you can see the results. This is a photo of John who as you can see is a very good polo player . is a horse smell in the air I am one happy painter. 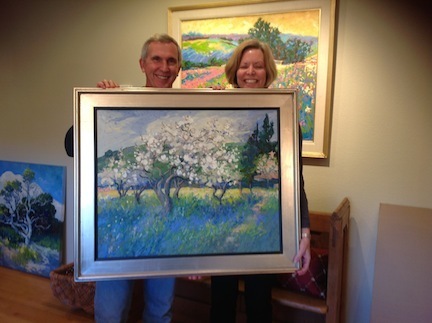 This couple saw my work at Nancy Dodds, they must have mentioned that they live here in Moraga, and of course Nancy said so does Teresa. 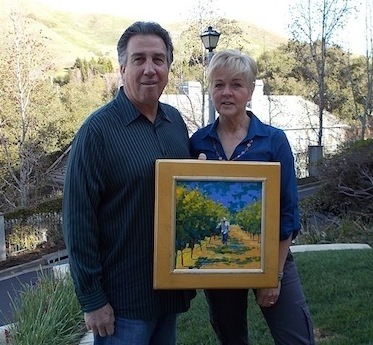 So I was so lucky they came to the studio, (house) and picked out this painting of an area in Moraga that we all know. Lucky me to be able to create something they want to have. Life is good when get to meet such nice people. Hope I get to see them around town. 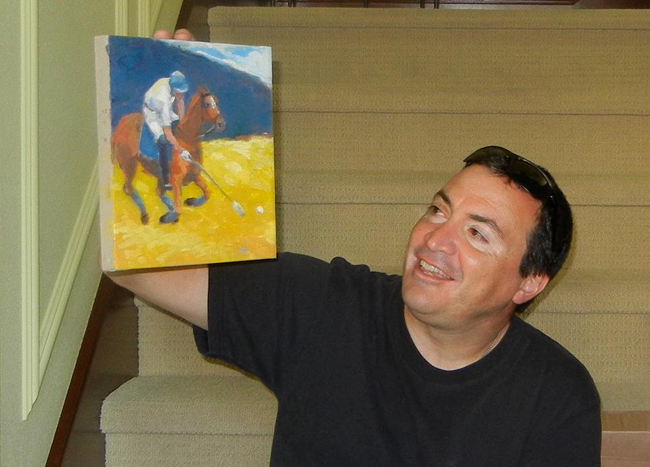 I painted two polo paintings and posted them on facebook. 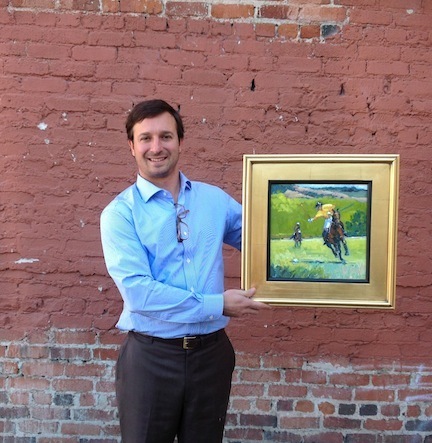 I heard from a collector that her husband loves polo. It just so happened his birthday was in a few weeks---birthday present problem solved! Such nice people so glad they have a few of my works. I met Phil and Shannon at the Lafayette Art and Wine Show. I was painting a little 12 x 12, they saw it and bought it on the spot, it was about 1/3 done. Gotta love people like that. I finished it and it now hangs in their house. Such a wonderful couple. They also have a vineyard that I did. What an absolute lovely lady in every way. 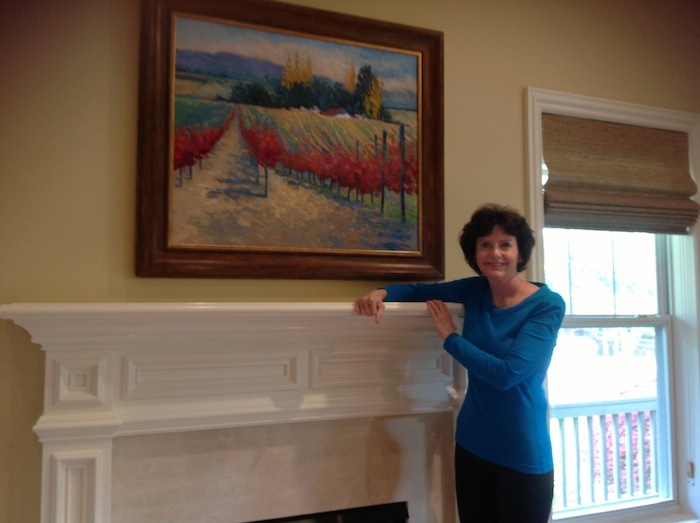 Beautiful,kind, marathon runner for alzheimer's, wine sales person, just a true pleasure. She contacted me and I happen to be going to New York soon. We met in the hotel lobby and talked about what she wanted. Well you can see the results. I am so lucky to know such wonderful people. 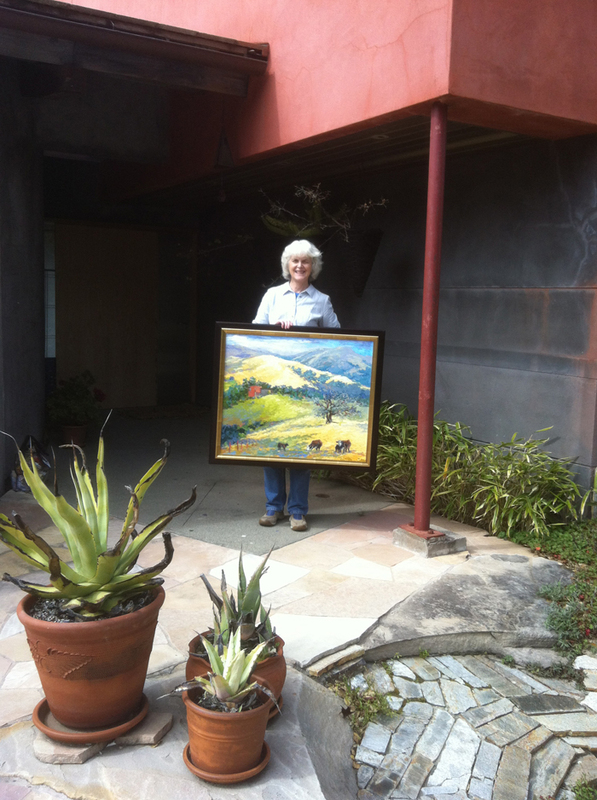 This lovely person had her ceiling repaired and in the process the workers got some white specks on this painting she purchased from Cohen Abee Gallery. She brought it over, we looked and sure enough there was the mysterious white stuff. My reaction was something most mothers have caught themselves doing. I used my point finger with a bit of spit and no more white spots. Loved meeting this delightful woman, hope our paths cross again. 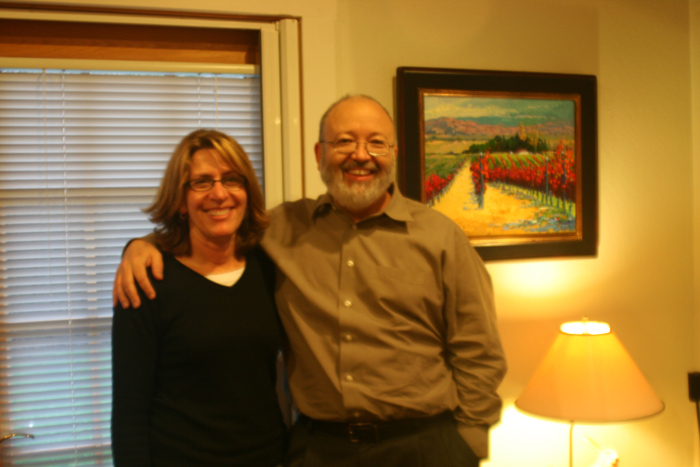 This lovely couple have a 360 view of the San Francisco, the coast and pretty much heaven. 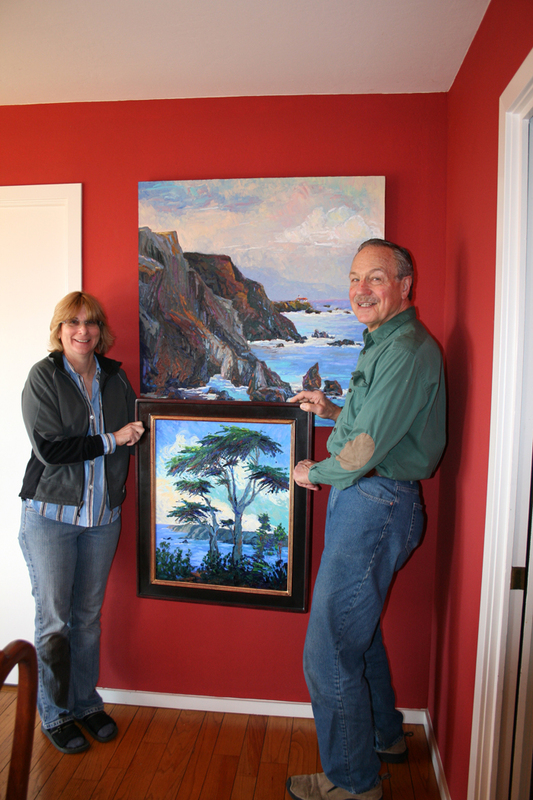 They had purchased one painting and commissioned the other. Since they had such an amazing view I really had to make sure my work did not upset mother nature. They were very happy with the results and so was I. In our little town there are pear trees. This pear tree is next door to the hardware store. I could not make this up! 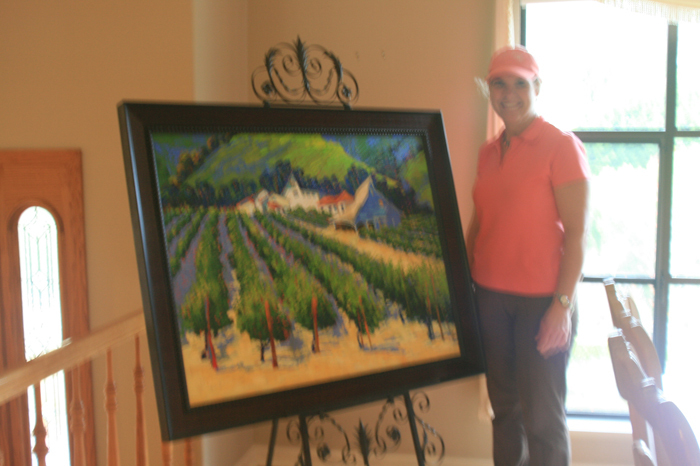 I displayed this painting at the "Preserve Lamorinda Art Show," Our former mayor and his wife purchased this painting. 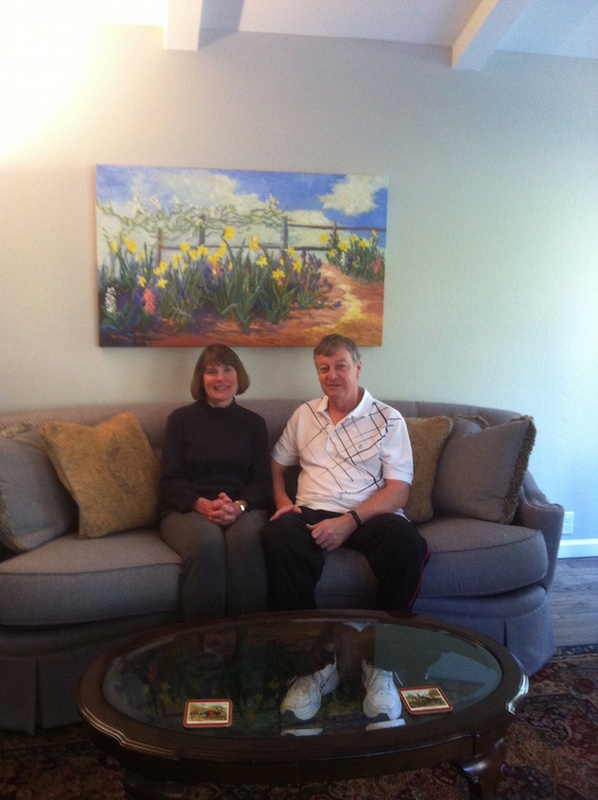 Here is the painting on their wall, they also commissioned me to paint a painting of their house. "See Below"
This house was designed by an architect from Berkley with lots of input from the owners. It truly is an exceptional property. The owner has been our town's mayor, his wife is a writer. 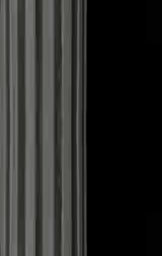 Clearly this was a challenge to do this house justice in paint. 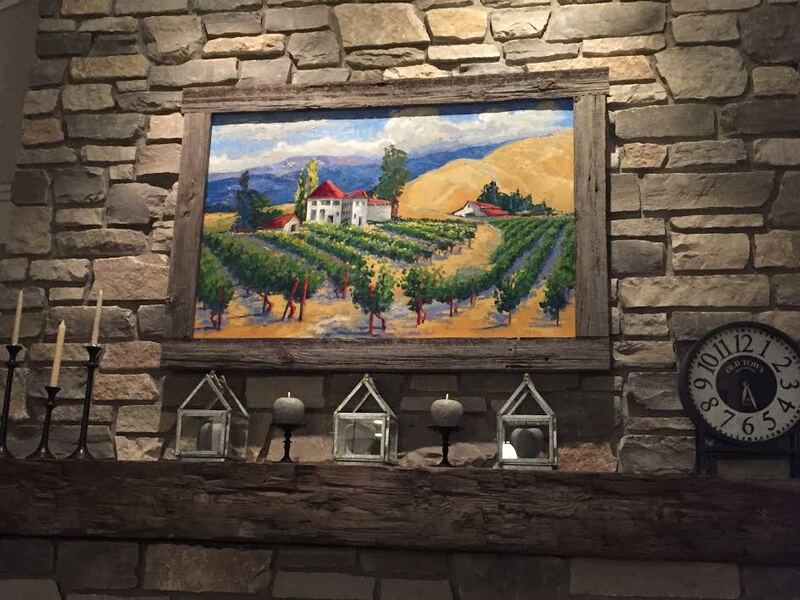 There is a old oak tree that is very visible from the house and that needed to be in the painting. We hiked to the next ridge on a a very foggy morning to see the tree. I was thrilled to put this sentinel in the painting. The cows just had to be in it too, they got to know me on my many hikes. 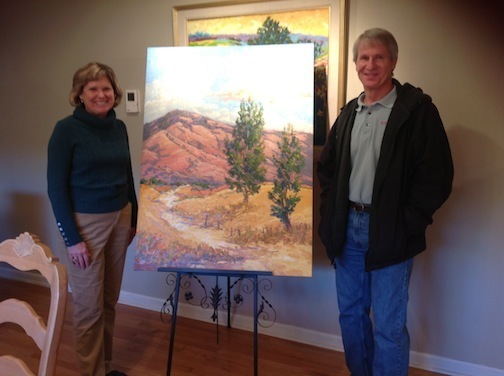 This charming couple had shopped at Nancy Dodds Gallery in Carmel, liked my work and wanted to see more. It just so happens they live in the next town. They came and looked at all of the art, it was a wonderful day and a real experience for them. They walked away with this little gem. They really are a special twosome. This lovely family lives on a ranch in the bay area. My job was to go with the mom and little ones on a hike to the next ridge to shoot the property and then paint a painting of the ranch. What fun. 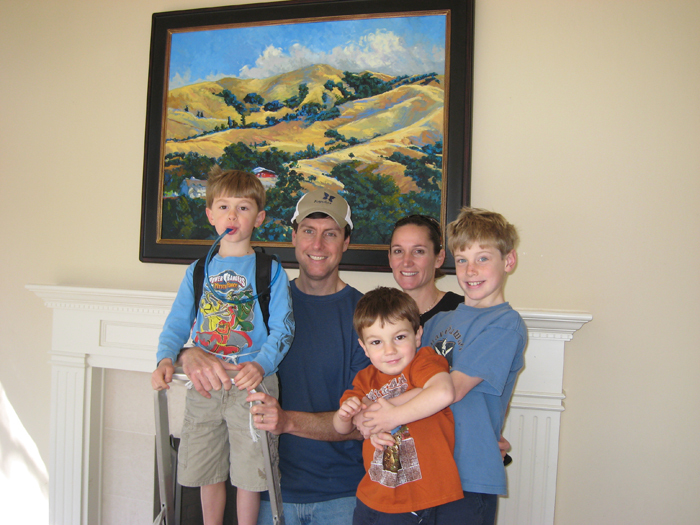 I loved the kids, the mom, the hikes, and the painting worked. The dad was a pro athlete and the mom is quite an equestrian. Can't wait to see what the kids will be. This was a conspiracy! Linda wanted to give Keith a surprise for Christmas. I think she did it! 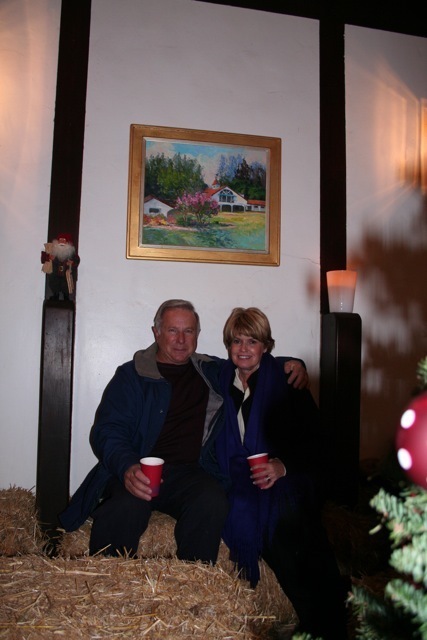 Linda and Keith are these wonderful people who have a Equine Facility Extraordinaire. This painting is of the main home. You might recognize it, it was in a movie with Liz Taylor. Yes, National Velvet. This was a real treat for me. I met Donna at La Jolla Art and Wine Festival in October. 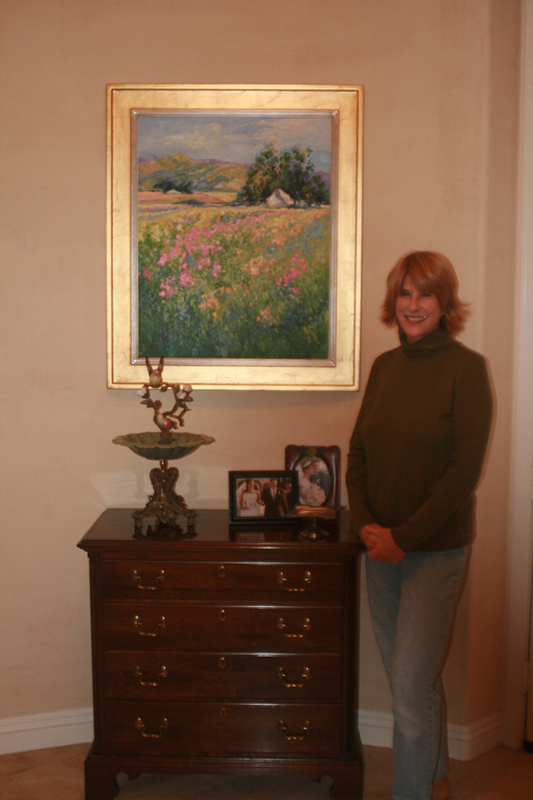 Donna was interested in having a pastel painting for a certain spot in her house. We talked about possibilities, a flower field seemed to be the first choice and St. Mary's trees being the second. Pastel seemed to be the main theme. I had not been to her house but put out the paints that seemed to be what she was thinking. 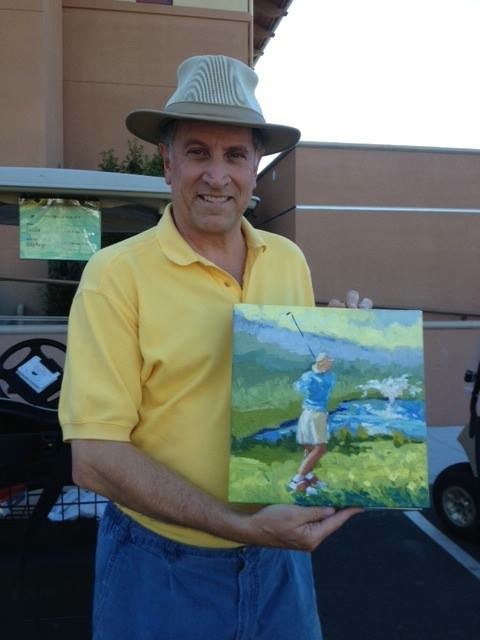 I was pleased with the painting and brought it down to San Diego area. My son was with me so that made it even more fun and the extra long arms for hanging was a plus. The moment I walked in I knew the flower field was perfect. I loved the way the little bird wings overlapped the frame, just perfect! Donna was a dear, her house was so interesting, one watercolor painting was of her grandparents house, and the floor plan. It was pure magic. Thanks Donna what a pleasure. This is a painting of Cypress trees at the coast. Rob is a collector of mine and commissioned me to paint one of my favorite spots. Lucky me!!! Rob was in San Francisco and came to the studio, saw the painting, then he was going to be in Bakersfield, I was going to L.A. and dropped off the painting in Bakersfield. 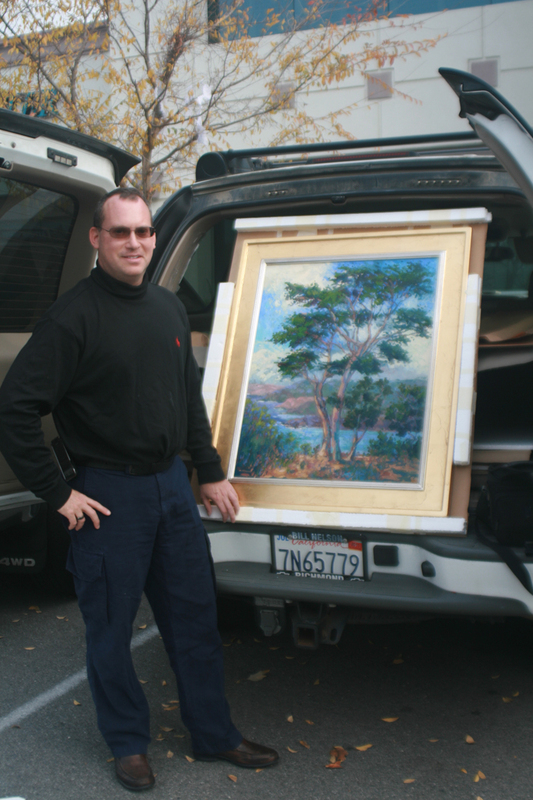 It was fun having this art connection in a parking lot. Rob now has 4 of my works, hope he loves them. T. Onoda is very prolific and is able to produce high quality paintings sought after by art collectors upon demand. 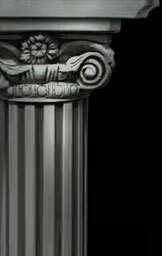 Looking at this Web site's Gallery will show the expertise in the style and artistic ability. Feel free to go to Nancy Dodds Gallery in Carmel, or Kavanaugh Gallery in Des Moines, Iowa to see some of the artist's work, or go to their site and look for the artist work.